"This one goes out to all my friends at the Wash, I hope they getting they wash on there." Drug humor in movies is very difficult to pull off. On the one hand, you can have all the characters doing drugs and acting stoned. This worked for the first Friday film. Or, you can have a lot of wacky drug humor that will be funny as long as the viewing audience is stoned. This worked in the intolerable-if-sober Half Baked. Then there's The Wash, which certainly isn't the former, and the latter... well, let me just say: there's not enough pot in the world. Superstar rap duo Snoop Dogg and Dr. Dre play less wealthy versions of themselves. 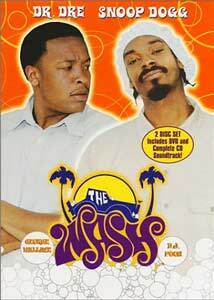 The two are hard up for cash to by "fat blunts" and to pay the rent on Dre's "dope ride," so they finagle themselves a job at the local car wash, run by the tyrannical Mr. Washington (George Wallace). He bosses them around, eventually straining their friendship when he puts Dre in a managerial position over Snoop. It takes about an hour for all of this to happen, and in the meantime we are treated to a lot of wacky hi-jinks, including enough superfluous cameos from various rap stars (Shaq, Eminem) to qualify this as the hip-hop equivalent of The Player. Snoop sells pot. One character is accused of stealing money from Shaq's car, so he beats them up. Dre gets a skanky girlfriend who immediately dumps him, leaving the film about four minutes after she entered it. None of this material is funny. It does, however, take up time. And since filling 90 minutes seems the requirement of any theatrical movie, I guess these scenes can be explained away, if not forgiven. Finally something happens when Mr. Washington is kidnapped and that nutty carwash gang must team up to get him back or risk losing their jobs. The kidnapping subplot is as poorly handled as everything else, of course, but it does produce a few scenes that are at least mildly interesting, and one (1) joke that actually is recognizable as such�the kidnappers? They are really, really stupid. Chortle. I'm not a rap fan, but I do recognize the appeal of seeing your favorite singing stars in a movie, and Snoop and Dre are passable, if clearly amateurish, in their roles. Writer/director DJ Pooh seems to be having great fun with the material (judging from his cameo as one of the kidnappers), but the comedy must all exist in his head, because the script contains few recognizable jokes, which may be just as well as they'd be ruined by the flat direction anyway. If I was being clever, I'd say The Wash is a total wash. But then I'd also be annoying. So I'll just repeat myself: not enough pot in the world. Image Transfer Review: This is a fairly clean transfer, but the quality is limited by the source material. Colors look rather dull and show a bit of grain at times. Blacks look OK, but shadow detail suffers and darker scenes look grainy. On the plus side, I noticed no artifacting, edge enhancement, or aliasing. Audio Transfer Review: The Wash features a typical comedy mix, with most everything happening across the main soundstage. It sounds ok�clear dialogue, some directional effects, and a fairly wide soundstage�but with very limited dynamic range. Only during the frequent scenes accompanied by a rap track do the surround and LFE channels kick in to add a bit of life to a rather dull mix. Adequate, I suppose, but only just. Extras Review: The sticker on the packing proclaiming this a "2 disc set!" might entice the film's fan(s? ), but the extra content barely warrants a mention, let alone your valuable time. Most fluff featurettes edit down PR interviews into quick sound bites, providing a lot of information in a fairly slick manner, even if I do get sick of watching them on DVD after DVD. Well, never again shall I bemoan an HBO "making of"-type extra, because I have seen the alternative: The Wash just gives us the same interviews, in complete, unedited form. They are divided into two separate menu screens. Premiere Coverage features separate two minute clips of all of the stars being interviewed as they walk down the red carpet at the film's premiere. The interviewer, who must be the whitest man on the face of the planet, tries to ask insightful questions, like if the guys got "so crazy" on the set, but no one really answers him as they try to cram in "mad props" for all their "West Side homies." Interviews features more clips, these of the familiar "stars sitting in front of the movie poster" variety. These clips are actually kind of funny in a sad way (or sad in a kind of funny way) because the questions from the poor interviewer, a woman who is obviously fairly inexperienced, have been included, and she keeps stuttering, stammering, messing up, and saying "um." Each clips runs for about two of the longest minutes of my life. The trailer is offered, and hidden on the main page (just click the Lion's Gate logo) are more spots for Cube 2: Hypercube, State Property, American Psycho 2, and Monster's Ball (guilty by association). Finally, there's a raunchy music video from Dr. Dre for the song Bad Intentions, featuring a cameo from the sensibly named Knoc-Turn'al. Disc 2 of the set is simply a CD of the soundtrack, which I'm sure will excite those of you who wouldn't rather listen to Hanson. The inclusion of the CD just barely bumps up the grade to a generous C-. Rap fans might like The Wash for its star power. Insomniacs might like it for its sleep-inducing, agonizingly slow, laugh-free pace. I liked it for its running time, because more than 90 minutes might have caused my eyeballs to explode.